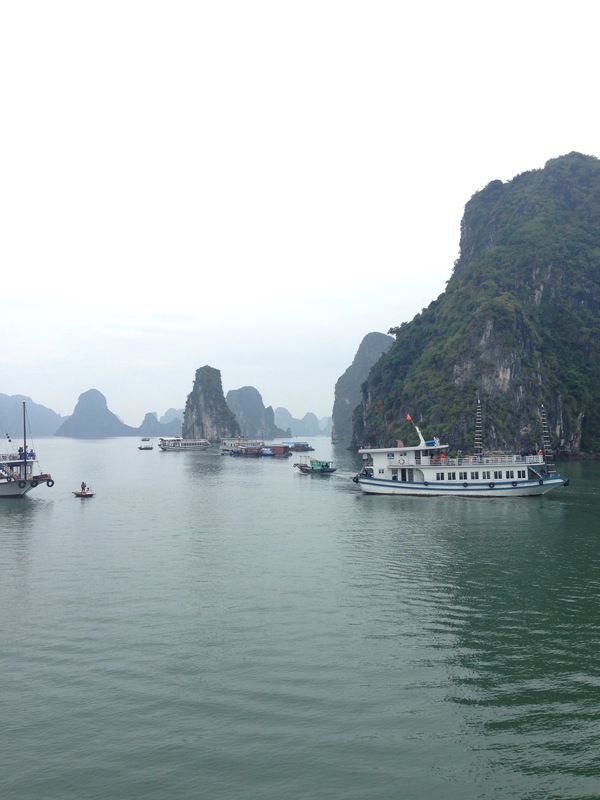 Halong bay has been high on my list of places to visit for quite some time and finally the time had come to see it with my own eyes. The bay has around 1,600 island limestone karsts, most of which are uninhabited and untouched due to their shape and size. In 1994 It was named a UNESCO World heritage site and since it has also been named a 7th wonder of the Natural world. 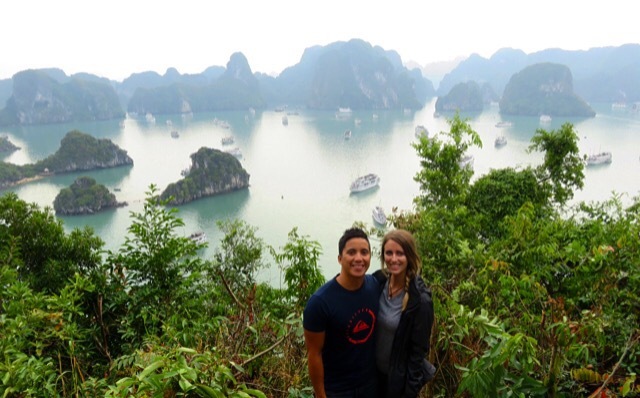 There are so many tour companies offering various tours to the bay so it can be a little overwhelming when trying to choose the right one. We read plenty of horror stories online of unsafe/ dirty boats, awful tour guides and not getting what you paid for. After a lot of research and a recommendation from a friend we decided to do a two day, one night tour with the company Fantasea. It turned out to be absolutely perfect and exceeded all our expectations. 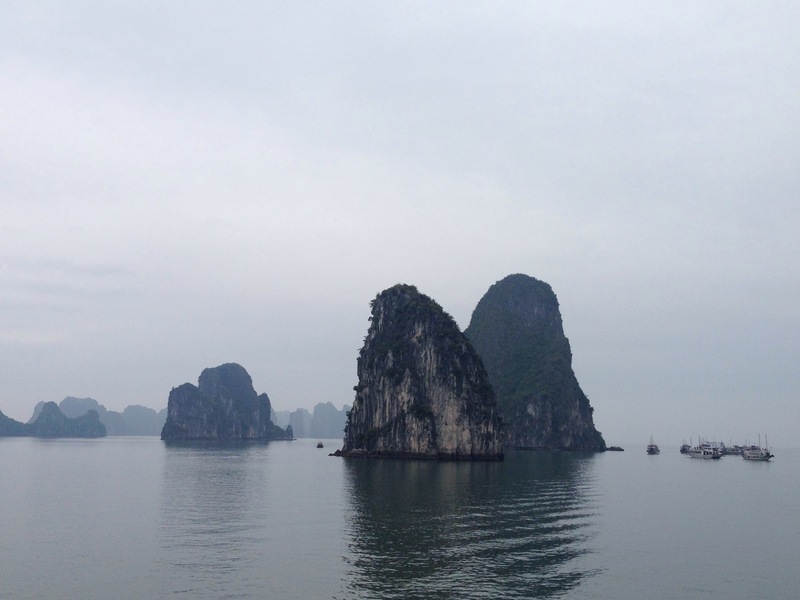 We were picked up from our hotel in Hanoi at 8:30am and started our 4 hour drive to Halong city. Tom and I are getting pretty good at this whole bus travel thing and managed to sleep the whole way. Our group was made up of 11 people. Some Russians, some French, a German, a Korean and a Singaporean. When we got to the harbour we boarded a smaller boat to take us out to our boat for the next two days. The first thing they made us do was put life jackets on. This was a good sign! 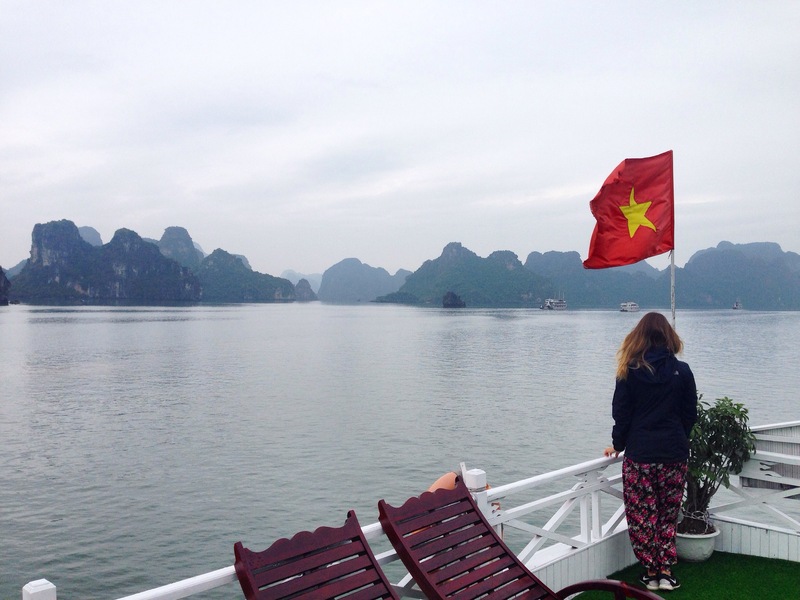 We had quite low expectations when it came to the boat we would be staying on so we were pleasantly surprised when we arrived at our boat. Firstly, it was much bigger than I expected. It looked a little old on the outside but on the inside it was really nice. It had a nice dining area and a lounge area with a couch by the bar. Our room was spacious and looked like a hotel room with a window and a private bathroom with hot water. 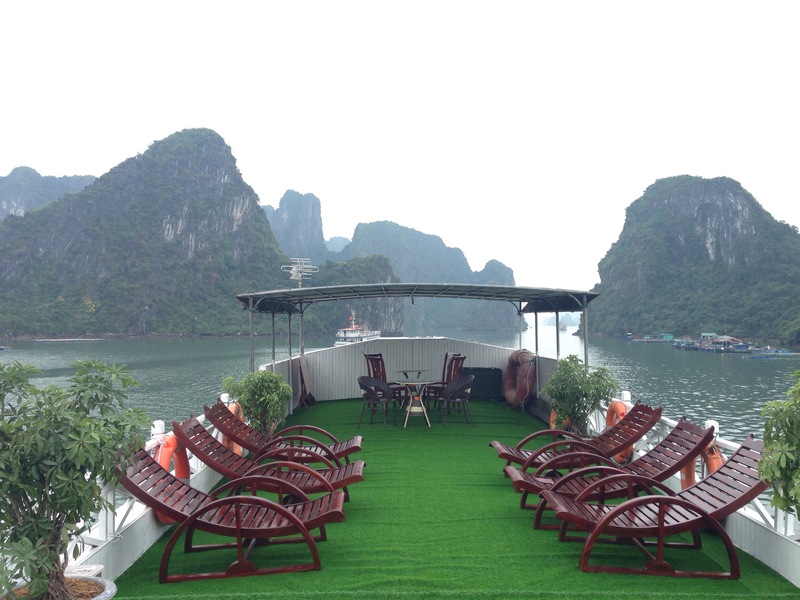 The top deck had fake grass and lounge chairs. Once we had put our stuff away it was time for lunch. The amount of food they served us was ridiculous, there was so much of it. Rice, chicken stir fry, a whole fish, tofu, calamari and veggies. It was far too much for all of us to eat. It was delicious. 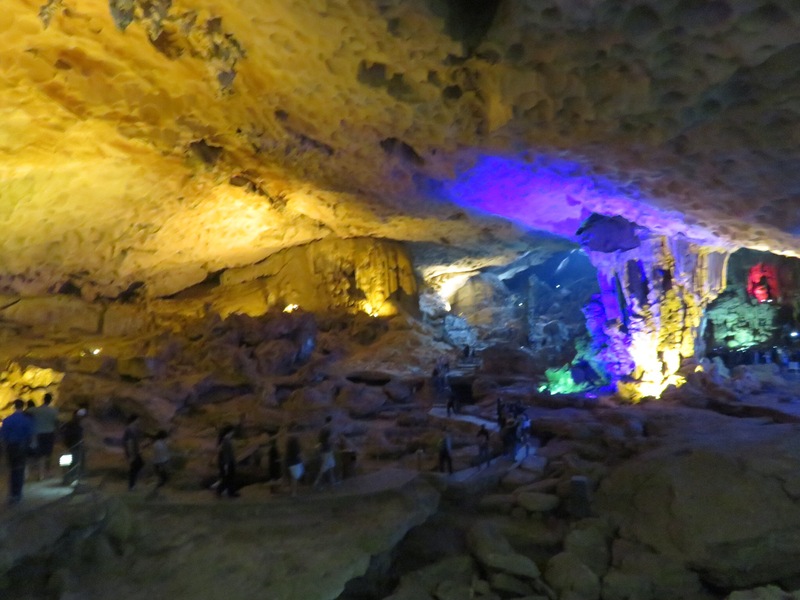 After lunch and cruising the stunning Halong bay we arrived at our first destination- Surprise cave. Our lovely guide Tuon, took us on a tour of the cave. It consisted of three chambers and it was huge. By far the biggest cave I have ever been in. It was a shame about the coloured lights they put in as it took away from the naturalness of it all, but aside from that I really enjoyed it. There was a beautiful view of the bay from the top too. After the cave we cruised a little farther and began our kayaking adventure. Tom and I are big fans of kayaking so we had really been looking forward to it. We were the first people to get into our kayak. The water was a deep emerald green and it was so calm it looked like glass. 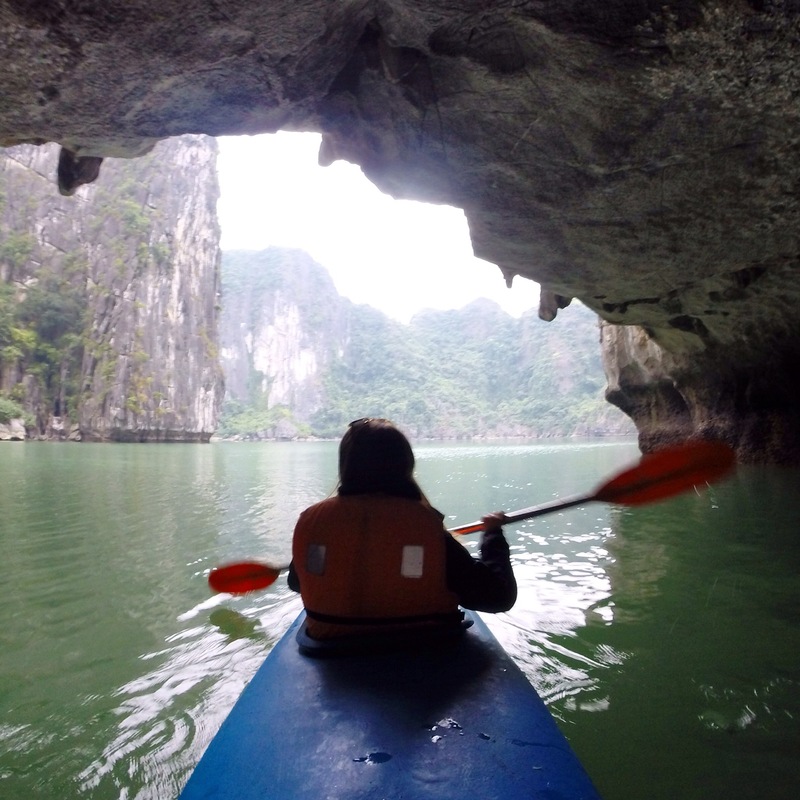 We paddled through a small cave into a lagoon. Since it was just us in the lagoon it was completely silent. It was so peaceful and serene… until the monkeys started throwing rocks into the water from above! 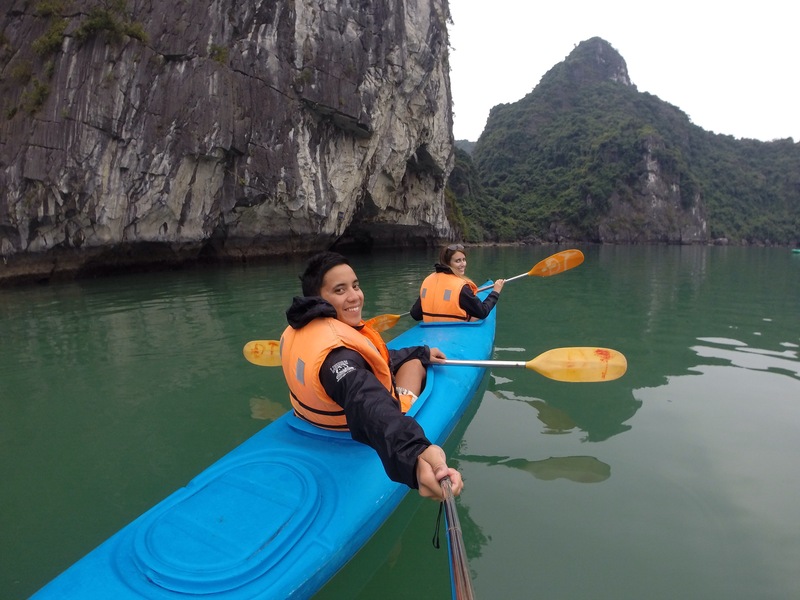 We spent around an hour kayaking around and even though it was cold and rained a little we still thoroughly enjoyed ourselves. By the time we got back on the boat it was 5pm. The day had gone so fast! 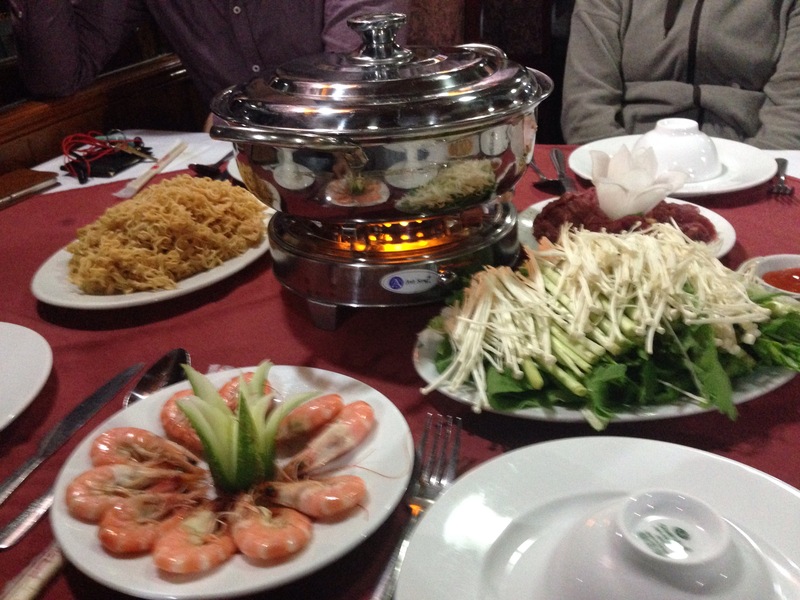 We had another huge meal (chicken, prawn and beef hot pot) and then we all had a go at squid fishing off the front of the boat. I have very little patience when it comes to things like this so I was over it in about 5 minutes. It was so cold outside and fishing to me is so boring! Half an hour had gone past and no one had caught anything. Tom and I decided to call it quits and go have a shower and go to bed. One of the guys caught a squid after two hours. Now that’s patience! After an amazing sleep, we were up at 7am having yet another huge meal. By 7:30 we had arrived at Ti Top island. If the weather had been nicer we could have swam at the beach but since it was overcast and cold we decided to climb up the stairs to the top of the mountain. It only took us about 10 minutes to get to the top. From the top you could see lime stone karsts for as far as the eye could see. It was an absolutely stunning view. One that will stay with me forever. 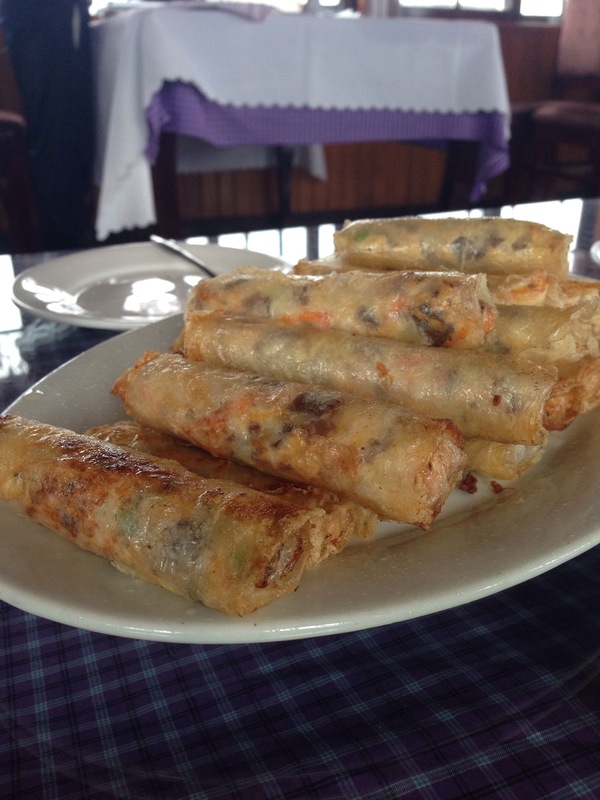 After that it was back on the boat for a spring roll cooking class, more cruising of the bay and another huge meal before arriving in the harbor. As soon as we got off the boat it started pouring with rain. Excellent timing! I was so glad we had decided to only stay the one night. We got on the bus for our four hour journey back to Hanoi. We were exhausted! 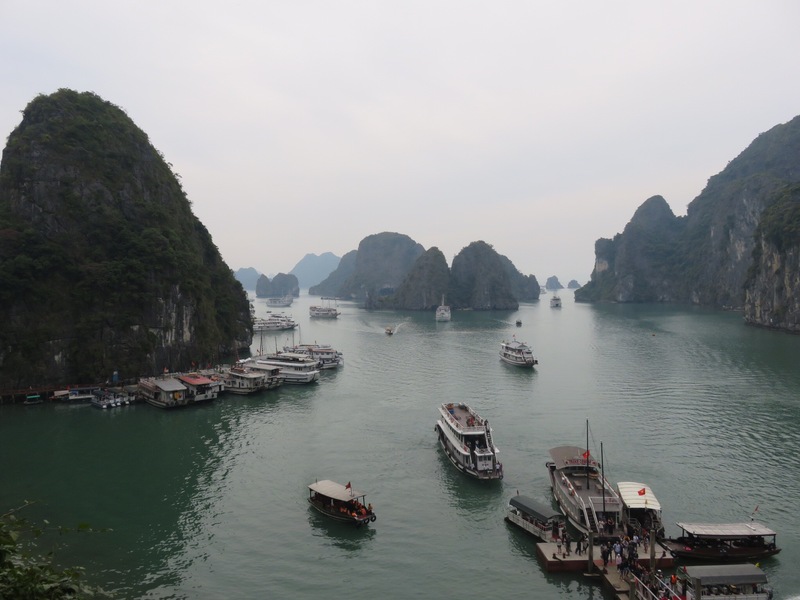 I had read and heard stories about Halong bay being full of trash and over run with tourists. We didn’t experience any of this. There was no trash in sight and even though there were quite a few boats around it didn’t ruin the peace or beauty of the bay. Thankfully, the bay is so calm and protected that I didn’t experience any seasickness like I usually do. Our trip was short but sweet and we had such a great time. I would highly recommend Fantasea as a tour company for this trip. 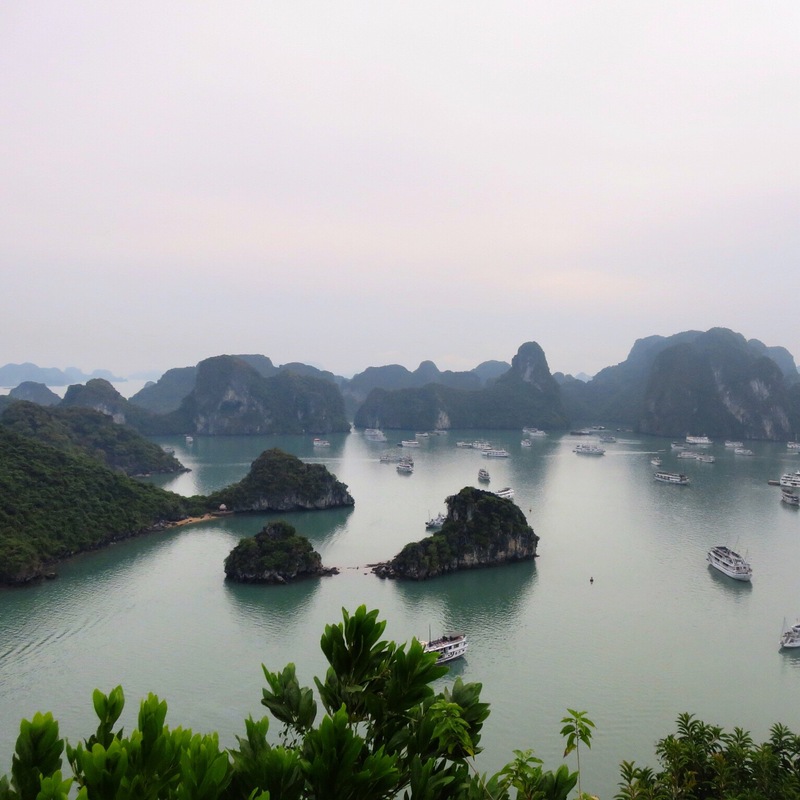 Great post ~ Vietnam is on my list to visit as well and this made me want to put it at the top! Thanks for sharing the tour company ~ always so helpful. I’m thinking of booking a tour with Fantasea. Did you book through the cruise operator itself or through your hotel? Also, how far in advance did you book? We’re arriving in 2 weeks. Love the photos!